THE Cat Community Radio has finally achieved its ambition and now broadcasts on air - rather than through its website. Tune in to 107.9.FM to hear the broadcasts. The station went on air on Saturday, February 14. 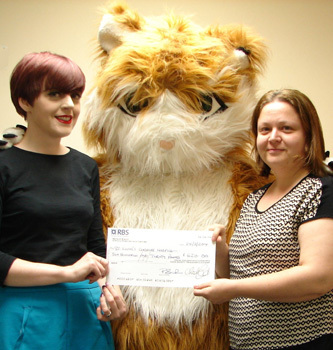 The Cat has been well supported by three local councils, with Cheshire East Council contributing £18,892 ahead of the launch, Nantwich Town Council £13,103 and Crewe Town Council £1,000. Money from Nantwich Town Council's grant was used partly to install the station's transmitter on the roof of South Cheshire College - their new "home". Strictly speaking the radio station is now outside the area of this website, but it has been a part of the Nantwich scene for so long that it will still feature on "A Dabber's Nantwich". Picture: The Cat Community Radio's Technical Director, Paul Simpson, pictured on the day the studio was launched. CONGRATULATIONS to The Cat Community Radio on achieving a long-sought-after ambition. The team of amateur broadcasters have been awarded a five-year licence to present their programmes live on air from a date yet to be announced. Later this summer. Up to now, apart from the occasional 28-day licence, which granted them the same on-air presence, their programmes have been available only on line. The Cat Community Radio team - that's them, right, in an image from their website - applied for an FM Radio broadcasting licence from Ofcom and then sat back and waited anxiously to see what would be decided. Also waiting were Crewe-based RedShiftRadio who didn't achieve their similar aim. before their dream comes true. Ofcom estimates the set-up work will take between four and six months. As Cat Vice-Chairman Chris Cadman says, there's "a great deal of work to do" to go on air. But he assured listeners and supporters, who include advertisers and sponsors, that they will be pushing hard to get on air as quickly as they can. This includes liaising with Ofcom and the transmission equipment supplier. As the preparations continue, the programming is "all in place", advertisers and show sponsors are being invited to be in touch, and anyone who wants to be part of the broadcast team is asked to contact the station via the website, www.thisisthecat.com, or e-mail office@thisisthecat.com. THE team's more formal name is The Crewe and Nantwich Community Radio Society, an organisation which was formed in January 2008 and that is now being incorporated into The Cat Community Radio. Nowadays, it is the done thing to issue a mission statement so that the world at large knows what you are about. In my younger days organisations just got on with it and people soon learned what they were about. But I have to say that Cat Community Radio's mission is impressive: "to provide the community of Crewe and Nantwich and surrounding area with high quality radio programming consisting of local music, local sport, local news and local views, and be cost effective". often be seen a local events providing the music and public address facilities as well as live on-line broadcasting. 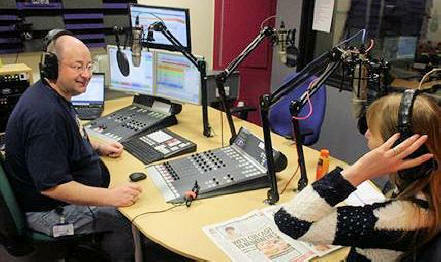 Community Radio studio, which will include a visit from the radio's mascot, Twichy the Cat. Alternatively, Twichy and a member of the radio crew can turn up at your event. No, I haven't mispelled Twichy's name twice. There is no "t" in it. He's not a nervy type. Think Nan-twich! But, although the radio team has advertisers and sponsors to keep going, they are not in it for the money. Cat Community Radio is a "not-for-profit social enterprise". Anyone can become a member for just £40 a year. While most of the members are presenters that is not something you have to do. As with a number of organisations there is also a need for behind-the-scenes people. If even that is daunting for you, I'm sure they could do with someone to make cups of tea . . . I SAID that the Cat Community Radio was set up in 2008, but the organisation has been around for 21 years. In that time Youth FM, YFM and Witch FM have led up to The Cat Community Radio. By the way, it isn't Cat Radio. That is the name of a few other radio stations which can get twitchy if someone uses their name. THE Cat Community Radio, which has been entertaining audiences in Crewe and Nantwich in previous years, is back on the air with a 28-day Restricted Service Licence (RSL) broadcast [from November 23]. Their studio was in Crewe. Paul Simpson, who is a contributor to "A Dabber's Nantwich" (Family Lines), e-mailed me to say: "We have moved and built a new studio at Frederick House, one of the old Barony Hospital buildings. We will be broadcasting on 87.7 FM. Full programme details are available on our web site with a 'listen live' feature at www.thisisthecat.com." The radio is staffed by a group of amateur broadcasters and this is their third RSL licence. There's a studiocam feeding a live picture of the presenters to The Cat website. I SPENT a happy two hours at the studio as a guest of Paul, telling the listening audience about "A Dabber's Nantwich" website, Nantwich Players and the extension to the theatre building - and getting a "plug" in for the new video about curiosities in Cheshire, "More Cheshire Curiosities", that I and two amateur colleagues had made. launch of "Further Cheshire Curiosities". Visit the Jonboro Videos website for more details. Partly because I wanted to get the picture above, and partly because I had turned down Paul's invitation to appear on his show when the studios were in Crewe, I went along to Frederick House. Without wishing to make it sound too easy (which it definitely is not), presenting the show is a mixture of introducing a variety of records, giving information about local events, taking a feed of news bulletins from Sky News, and interviewing any guests. This means that everything has to run to a tight schedule - particularly finishing a record in good time, without simply fading it out - to receive the news bulletin which goes out at a set time from another location and to other stations or websites at the same time. There's no asking "Can you wait a second?" True, the computer plays a big part in this, but - particularly when there is a guest to be interviewed - the presenter can override the running schedule "on the fly". That is, as he or she goes along, omitting a record from the list, or substituting another one. But even the bits the computer takes care of have to be loaded by a human being - i.e. Paul - before it can play the music, the adverts, the jingles, and short items "advertising" forthcoming programmes. At the time Paul was co-presenting with Julie Lewis but she was sunning herself abroad on the morning I called in. That didn't let her off appearing on air, though. Paul called her up in her hotel and they had a live chat as part of his programme. "I've got a guest this morning," he told her. "Yes," she said, "I can see the back of his head on the studiocam picture." My bald spot there for all to see! Speaking on air involves being up close and personal with the microphone - nose-to-mic, one might say - and speaking into the underside of the equipment! This is not easy and so I kept getting frantic waves from Paul to get closer to the microphone. I think I was getting the hang of it towards the end of the broadcast. All of the Cat staff - on air and off it - are amateur broadcasters with jobs to fit their radio duties around. Anyone who knows me will know I am a "background person", preferring to be backstage or behind a camera, rather than addressing an audience face to face, but I thoroughly enjoyed my brief time of fame via The Cat Community Radio.